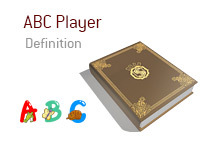 What does the term "ABC player" mean in poker? What is the definition of the term "ABC player" in poker? In poker, an "ABC player" is a player that plays in a very predictable manner. When they have strong hands, they play it fast and aggressive, and they generally don't get involved in hands when they have weaker holdings. "ABC players" are exploitable by good players as they have predictable betting patterns and are easy to read. A good player will mix up their play in an effort to fool their opponents. An "ABC player" will play virtually every scenario the same without any deviation from the script, so to speak. John Smith is a very "ABC player". He doesn't get involved in pots when he has substandard holdings, and he likes to play his premium holdings strong and fast. Other players at the table have caught on to Smith, and they are very reluctant to get involved in hands with Smith. A player in early position raises. Smith is next to act and looks down at pocket Aces. Smith puts in a re-raise. Everyone else folds after Smith re-raises, including the player in early position who put in the original raise. The early player flips over A-K offsuit, as he was certain that Smith had either pocket Aces or pocket Kings. This player was right, and Smith's strict adherence to a game of "ABC poker" probably cost him a significant amount of chips in this hand. As mentioned, good players will mix their games up.